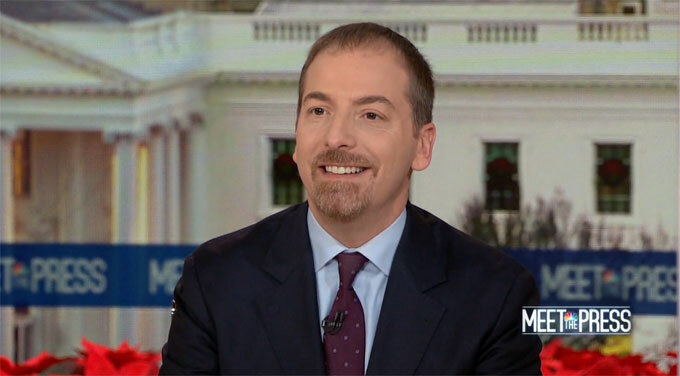 Meet the Press host Chuck Todd (Image credit: Meet the Press video). It was a climate-fearing couch potato’s dream-come-true: A full hour-long climate change episode on one of network television’s longest-lived and premier Sunday morning public policy talk-show programs. And without a peep from those designated by the program’s host as “climate deniers” . This morning, we’re going to do something we don’t often get to do, dive in on one topic. . . . We’re going to take an in-depth look at . . . a literally Earth-changing subject that doesn’t get talked about this thoroughly, on television news at least: climate change. But just as important as what we are going to do this hour is what we are not going to do. We’re not going to debate climate change, the existence of it. The Earth is getting hotter. And human activity is a major cause, period. We’re not going to give time to climate deniers. Todd then used news clips to portray the politics of the issue in the United States and, with clips of the yellow-vest protests in France, around the world. In a brief interview with former New York mayor Michael Bloomberg, Todd pointed to Bloomberg’s climate activism and asked how the Trump presidency has affected national and international actions on climate change. Bloomberg replied citing major setbacks he sees. Panelists were next up. Todd asked climate scientist Kate Marvel the first question: How do you explain the urgency [of climate change] to Americans? Other panelists were asked about the implications of climate change for American infrastructure, for the economy, and for national security. Todd then highlighted the destruction wrought by the 2018 Northern California Camp Fire to illustrate the devastating impacts climate change can have on American lives. He followed with a sort of exit-interview with Jerry Brown, the then about-to-retire governor of California. “What a tremendous hour,” Todd exclaimed when he thanked his guests and his viewers and wrapped-up the program. The Twitter world almost immediately went full-bore, with climate watchers applauding the special episode, hoping that what they had just seen could become the “new normal” for network TV coverage of climate change. “It’s about time,” responded some climate scientists and communicators who had long criticized media coverage – or, more often, non-coverage – of the issue. Liberal Media Matters highlighted its 2018 analyses in which it criticized the Sunday morning talk shows for their scant coverage and for failing to include scientists on the rare occasions when they did talk about climate change. Over the following several days, these tweets were expanded into columns and reviews. Four commentators, in pieces written for Ecowatch, The Hill, Media Matters, and Mother Jones, recalled complaints that Meet the Press had recently mishandled the Black-Friday release of the second part of the Fourth National Climate Assessment. Media analysts had interpreted the Trump administration’s decision to announce the report on the post-Thanksgiving start of the holiday shopping season as an effort to bury the bad news. Instead, the transparent political maneuver made the report a magnet for every political talk show on the following Sunday morning, November 25th. But the producers and hosts of those programs had appeared ill-equipped for the discussions. When they asked why the administration was trying to bury its own report, they were unprepared to challenge or fact-check the answers they received from their panelists, none of whom had been selected for their deep expertise on climate change. Some of these commentators resorted to common climate-doubter talking points to challenge the scientific evidence or to question the integrity of the scientists who wrote the report. The talk-show hosts offered no rebuttals. Those Sunday morning talk shows were roundly criticized for fumbling the coverage of the National Climate Assessment in these ways, none more so than Meet the Press. Did Trump inadvertently prime the media pump? Perhaps reacting to criticisms of its November 25 episode of State of the Union, CNN on December 10 released a video featuring several of its own meteorologists. “Don’t believe these climate change lies,” CNN cautioned its online viewers. The December 30 episode of Meet the Press feels like a much bigger – and better – version of the CNN video. Could it be, then, that the Trump administration’s decision to release the National Climate Assessment on Black Friday may actually have backfired? Did it not only fail to bury the report’s dire findings amidst the rush of holiday shopping, but also induce a much-needed reflection, by some in broadcast television, on how – and how in-depth – climate change is reported? Look at it this way: The administration’s Black Friday release of the Fourth Assessment Report elevated coverage of it to the top news talent at the major TV news organizations. So the resulting criticism of that coverage may have struck a higher, more sensitive nerve than usual, prompting a more decisive response. Media criticism works most effectively, in this scheme, when top-tier media personalities are on the line. And especially, and perhaps more accurately, when significant political media personalities are on the line, as politics is among the biggest beats on the screen. More broadly, Meet the Press’s “extreme” coverage of climate change suggests that President Trump’s embrace may be bad for climate science cynicism. The individuals and groups who distort climate science and obstruct climate policy for a living must maintain a veneer of probity and accountability. That’s why they simulate peer-reviewed research and its artifacts: journals and reports. But having learned to deal with Trump’s more blatant misrepresentations, by constantly fact-checking his remarks, the political media may now be better prepared to challenge the more subtle shadings of climate contrarians and their fossil-fuel-industry funders. In addition, through Trump the rejection of climate science is now associated with other, more highly visible, positions. Climate denial is now part and parcel of Trump’s perceived or real animosities toward science more generally, immigrants, international alliances, and global trade. In short, President Trump and his administration may be forcing people to rethink their ideological hook-ups and “isms.” Take a column published the Monday after the Black Friday release of the National Climate Assessment: Conservative foreign policy analyst Max Boot wrote that after rejecting Trump’s noxious views on trade and international relations, he could not abide siding with him on climate change. He urged other conservatives to admit they too have long been wrong on the issue. If, over time, the special climate episode of Meet the Press does lead to improved, “new normal,” television coverage of climate change, then, ironically, climate activists and communicators might have to thank Donald Trump for providing — however unintentionally — the impetus.